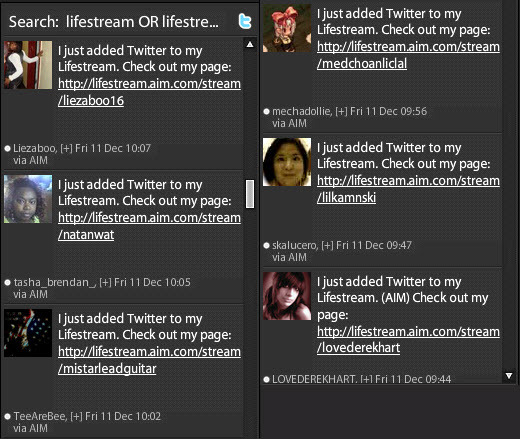 I have a custom search I use to monitor mentions of Lifestreaming on Twitter. Over the last few days I’ve seen an avalanche of automated tweets coming from users that have forced me to modify my search. See the stream for yourself here. At first I thought this may be part of the recent Lifestream Sweepstakes they launched, which could be part of the influx, but apparently now when you add Twitter to your Lifestream in AIM it prompts you to send an automated Tweet letting users know about it. I have to say I’m glad that AOL is really pushing their Lifestream inititive hard. They are probably poised better than anyone to help the concept reach the mainstream and by the looks of it, their users are joining in droves.